It will help me plan our future guild perk usage more effectively if I knew more about the Reinforcement Modules that are required to purchase the highest tier guild perk. My guess is that they are a static item like a Framework that sits in the guild bank/inventory and is consumed when a top tier perk is activated. This means they should be tradeable and sellable on the GTN. I want to know all this for certain. The standard way you get a Module is to complete your weekly CQ goal for 10 weeks. Each week as part of your CQ reward you get a single Reinforcement Component (bound to character). Once you get 10 of these on a single character then you can click the stack to convert it into a single Reinforcement Module. Pretty lengthy! 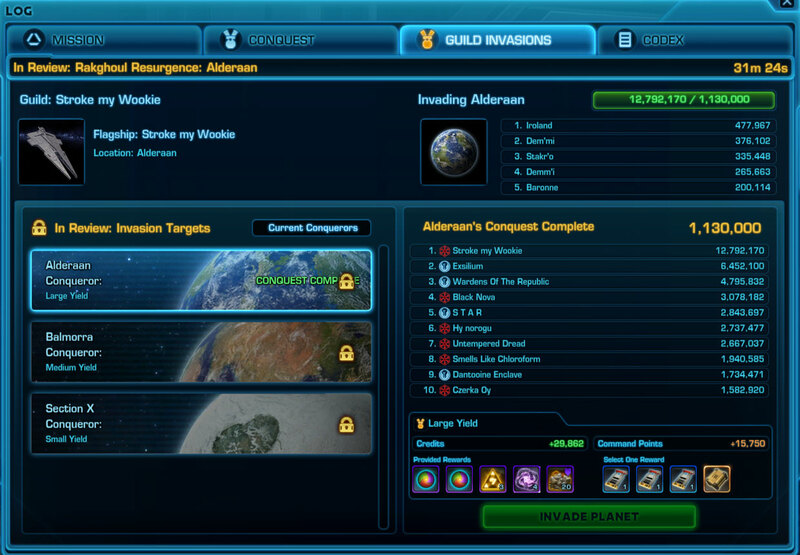 Since only a very small number of guilds on our server have reached level 12, I see no reason we can't enjoy this time limited opportunity so I will enable the Ossus Reinforcements perk for both Alpha and Beta so we can farm this new rare Reinforcement commodity. At the time of writing, Alpha is already lvl15 but Beta is still lvl10 so should ding 12 later this week. I will pay 5 million credits for each of the first 10 Reinforcement Modules traded/COD mailed to me on Ula Vii. The Ossus Reinforcement Perk is already active in Alpha guild so go do something heroic! Any guild member can read more about each perk by visiting the Perks tab on the guild panel. Hover over a perk to view the details. Don't worry about breaking the guild ship, you can't actually change the perks without a rank permission. There are 6 perk slots and each has several options including a single level 64 perk that requires a Module. These top level perks last for 14 days so a guild *could* get through over 12 Modules in a month. I think the actual usage will be much less since there are some other nice perks that don't require Modules. For now, time is a factor. Guilds are capped at 8m GXP each week (4m CQ points) so the large guilds that pass that limit every week will hit level 64 towards the end of February 2019. That means nobody can even use the Modules for the next ~2 months! It will take smaller guilds many more months to reach level 64 when they can use them. The slow speed of leveling Guild XP plus the weekly cap both serve as throttles on this market since they are the two main factors that prohibit buyers from the market. My gut feeling is that their cost on the GTN in 3+ months will be in the 100,000 - 500,000 range. There will be a fairly constant stream of people earning them just from CQ plus it's quite easy to farm the heroics with the perk enabled although the same could be said for Encryptions & Battle Masters and yet we've all seen how guilds can be lazy and the price of encryptions has crept back up to 400k+. 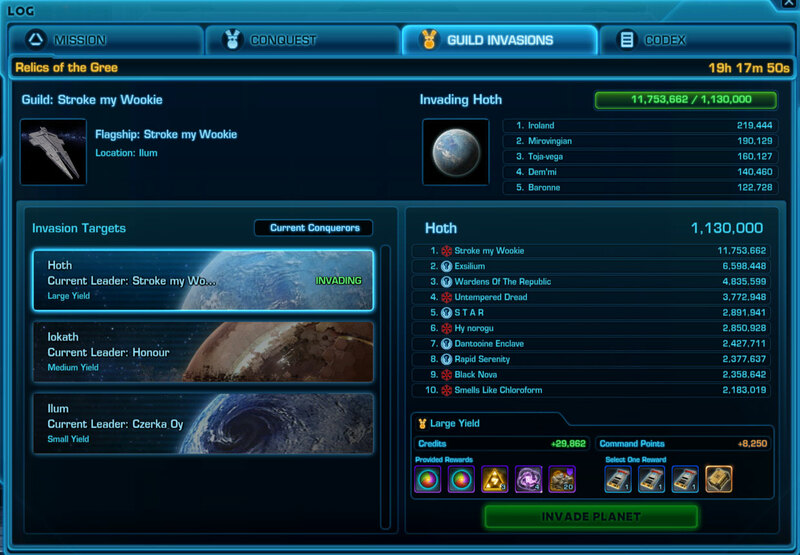 I think there may be some interest in Modules from buyers now just for the novelty and possibly as a gift to their own guilds. There's also the market for all the people in very small/solo guilds. I think the people advertising them in fleet will get quite a lot of negative replies as I've read messages from a few smaller guilds who feel the system it massively advantageous to large guilds. We just won't know what the market potential for them is until more guilds reach level 64. It doesn't do us any harm to stock up on them now so we have enough for our own usage. Our Beta and Rep guilds will still be taking part in our normal weekly conquest competition. There will be two contests this week Alpha: 150m for Ziost and Beta & Rep: Normal weekly prizes. Return of the Nightmare Crusaders! 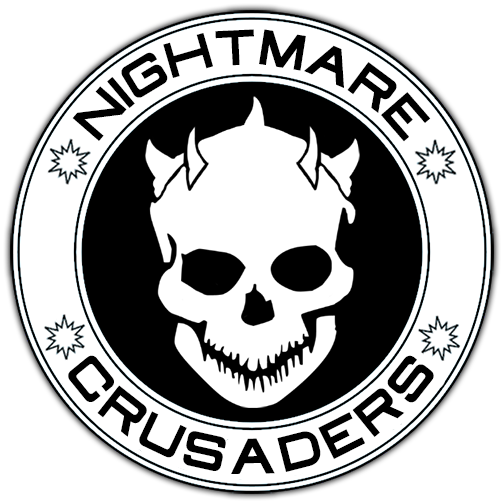 I am pleased to announce the return of our all star x16 nightmare raid team the Nightmare Crusaders. This is a group of excellent raiders from across the guild with Tizia, the Master of Nightmares as their squad leader. What is an "all star" team? It's a term used in sports as a shortened way of saying "the team is all star players". The Crusaders will be tackling the most difficult content in the game so the team will be a mix of highly skilled people from our x8 raid teams along with a few lone wolves. 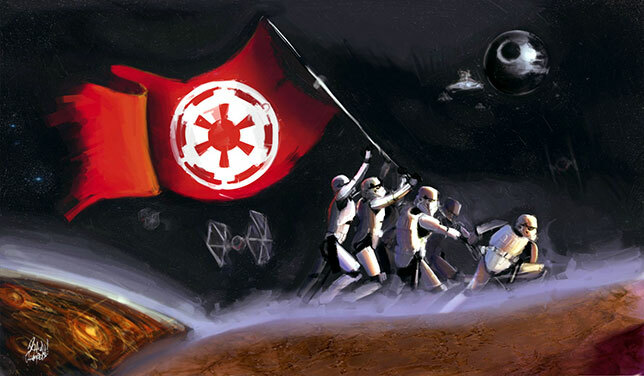 Think of it as a group of people that want to do something special on a day they are not raiding with their main teams. They will raid each Saturday afternoon at 13:00 GMT/UTC. This was intentionally chosen to avoid conflicting with our x8 teams schedules and general events. Trials will begin on Saturday December 22nd with the first official raid planned for Saturday January 5th. Please send a mail to Tizia on the site or in-game letting him know about your class, experience, the primary role you are applying for, your secondary role if you have one and anything else you would like to add about yourself. I'm great, why am I not on the team? There are limited spots. Tizia is aiming to have 20 people as permanent members of the team. Our past experience with fixed x16 teams is that with so many people it can be an issue to ensure that all 16 can be there each time. By having 20 people it means there should be enough people most weeks. But I'm waaaaaay better than some of the Crusaders, why am I not on the team? Tizia is aiming for a chilled group who can focus on objectives while handling their areas of expertise, not a group of prima donnas who think they are better than everybody else. Will they be using Nightmare Crystals? Nah, we don't consider it progress if crystals are used. With patch 5.10 we get some nice in-game guild perks we will be able to use to benefit players in our guild. If you open the guild panel you can see the Perks tab. The way it works is that I can slot different perks into the slots around the ship. These provide either passive or active abilities to each of your characters. You can see the details for the ones currently in use by clicking them in the slot. You can also get a preview of ones we will be able to use in the future by clicking them in the right hand column. There are some really good ones but they require a higher guild XP level for us to access. How do we get Guild XP? What do we do with Reinforcement Components? If you meet your CQ weekly score you now get a new reward called a Reinforcement Component. These are bound to the character. When you have 10 of them on a single character then you can click them to create a Reinforcement Module. You can then donate these to the guild bank officers vault. 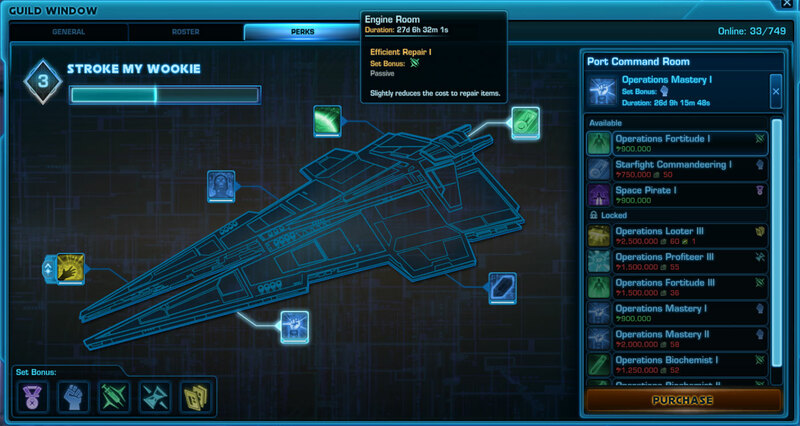 The modules are used to purchase some of the higher level perks. How will the perks be used? The purchased perks only last for a limited amount of time before they expire, usually in the 14-28 day range. If we want to change a perk then we don't have to wait for the perk to expire as they can be manually deleted to open the slot for another perk. Each slot has its own unique set of perks so we can't double up on them. The plan is that we'll focus on perks to help as wide a range of the guild as possible. That means having some perks which will apply to everybody and some which will be cycled to help specific groups at different times. For instance, I can work out a schedule with the progress raid leaders were we have a week of raid focused guild perk buffs. In a similar sense if we move ahead with the PvP training sessions (more info soon!) then we can also have weeks with more PvP perks (there's a sweet Valor boost). Each perk belongs to a different category. If all the perks we have activated at one time belong to the same category then we also get an extra set bonus. Each category has its own bonus. You can see the set bonuses in the bottom left of the Perks panel. On general weeks we will probably not have the set bonus active since we'll have perks from several categories but on weeks were we focus on raiding/PvP then we will factor in the bonus when choosing the perks. I'm going to be rewarding each raid team for their progress. 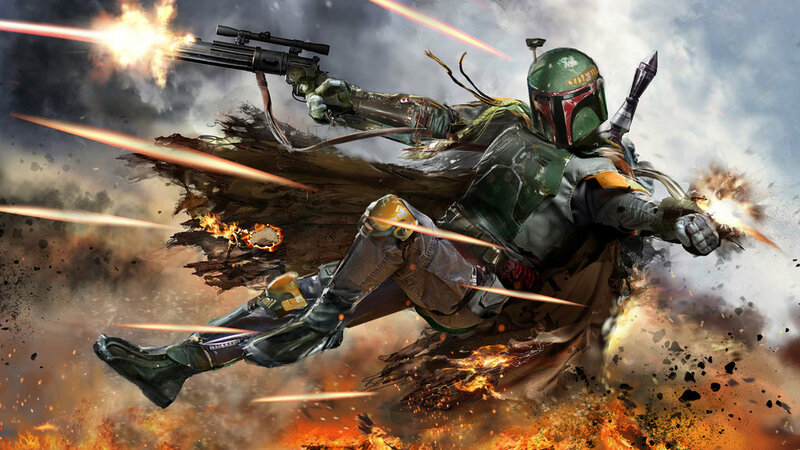 I've currently pegged 135 million credits per team and the rewards apply retroactively to their current progress so I'll be sending your squad leaders a big chunk of credits very soon. The squad leaders will handle distributing credits to their team members. That is also how it will work with future reward payments. This way in raids that span days/weeks you get rewarded as you progress through it instead of getting one big reward after the final boss. Any new x8 teams we form in the future will also be eligible for the rewards. Alpha focuses on taking 1st place each week using our conquest rotation which means it attacks all the small, medium and large yield planets in date order with the target each week being the one that we last conquered furthest in the past. This is the place to be if you want the conquest titles and achievements. Beta guild's goal is simply to place in the top 10 of the Large Yield target each week to help guild members get the large augment component crafting boxes. The aim is to help our guild members get rich with hardly any effort, not to take first place. 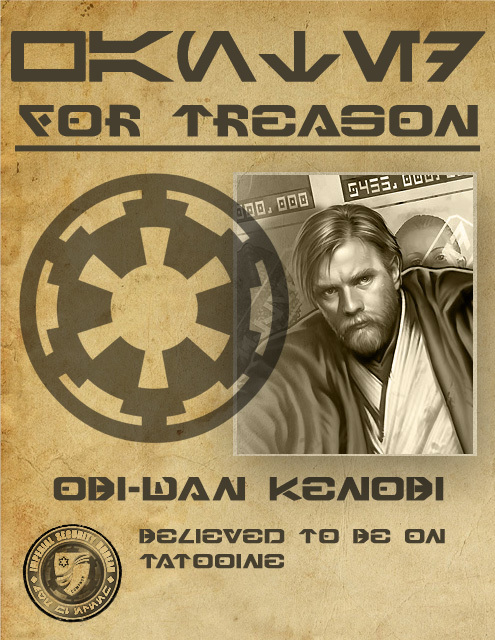 Our Republic infiltration guild is where we keep our Rep characters. Even though this is our smallest guild it still attacks the Small Yield target as it's super easy to get encryptions. It's also very handy for when we run our cross faction server events. 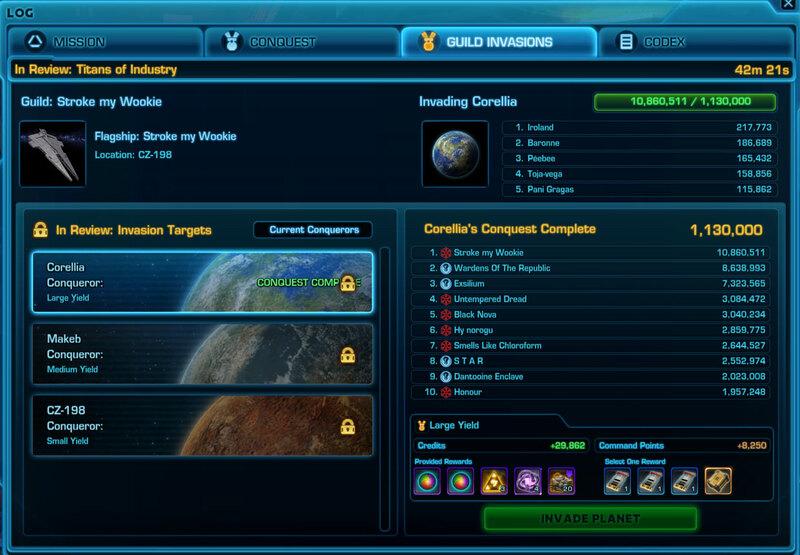 We've come up with another easy way for you to make credits whilst helping the guild. Basically, get us the lockouts we need for the Tuesday & Thursday conquest events and you get 2 million credits each time we use your lockouts! 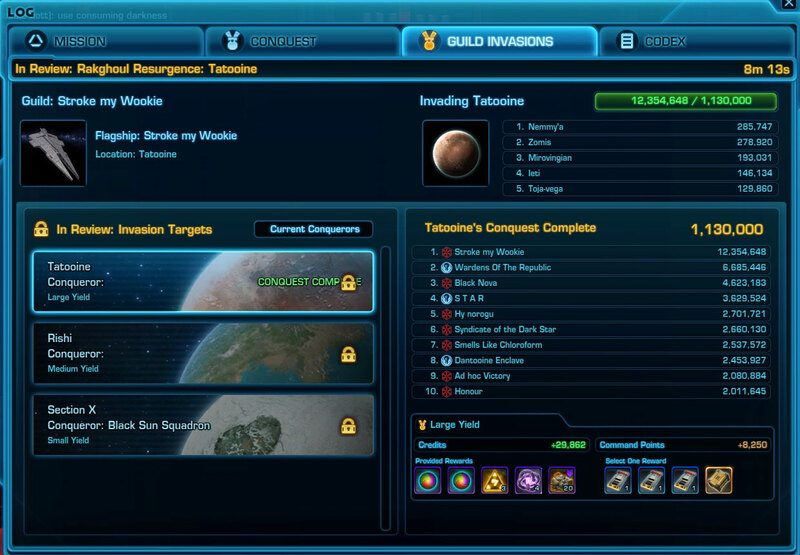 So if we have 3 groups that need lockouts at both CQ nights and there are 6 raids as objectives then there is over 70 million credits up for grabs. Check out the thread I made which has the details. I am pleased to announce our new Commander rank which re-balances the previous officer roles. We continue to have Grand Moffs but the rank is now more exclusive as it will only be granted to officers that regularly help with the wider guild admin tasks. The remaining officers and Black Knights have been combined to form the Commanders. This is a full officer rank which has most of the abilities of the Grand Moffs and many more than the old Black Knights. The primary difference between the ranks is that Grand Moffs help with the overall running of the guild whilst Commanders focus more on specific areas. 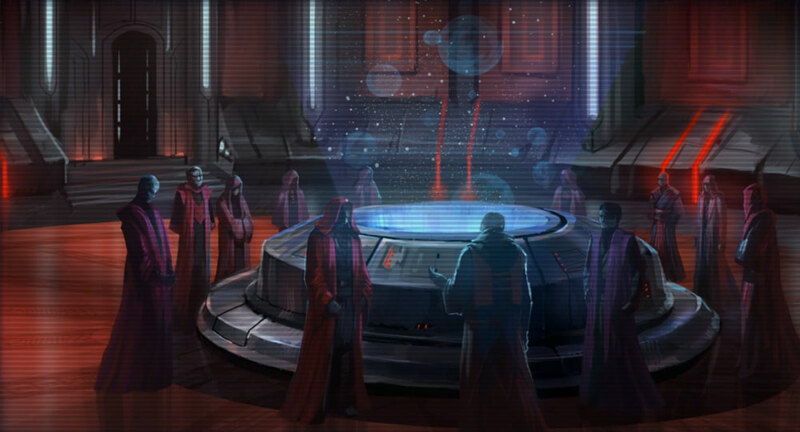 All Commanders have the option of being promoted to Grand Moff but they have to show they want to be more involved. A simple example and one that I've heard complained about many times is how we may have over 10 Grand Moffs online but none will throw a ginvite out while we have several Black Knights who would be more than happy to help with that. 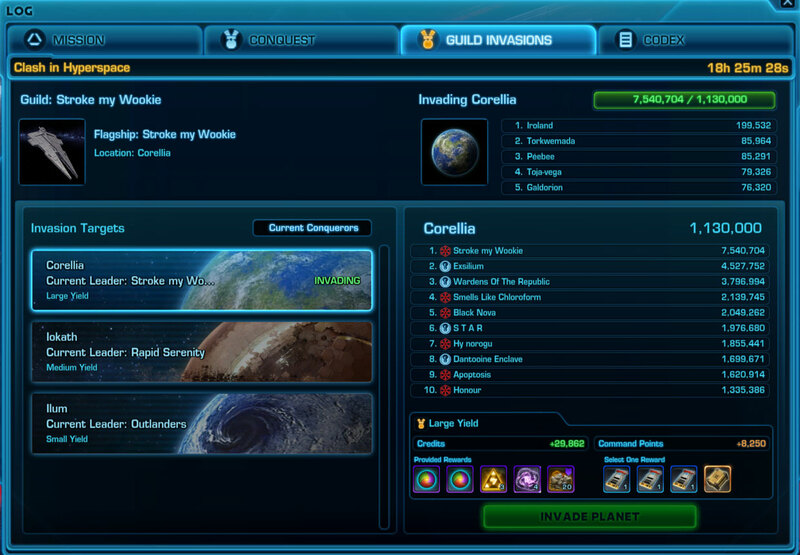 Now all Grand Moffs and Commanders can handle invites as well as several other admin tasks. This is a far reaching change that affects our guild in-game, on the website, in Teamspeak and in Discord. This refinement of our officer roles provides us with many advantages over the old system and helps ensure things run more smoothly for our guild as a whole.